Lately there has been a lot of buzz in the blogosphere on the associate-partner "pay gap" (Jeff Lipshaw, titled "The Days of Whine and Roses"), the application of Marxist economic theory to corporate law firms (David Luban), and what all the huge salaries and profits augur for the future of legal profession and legal education (Brian Tamanaha). All of it is worth reading, especially Tamanaha's insights on the growing fissure between elite and nonelite law schools. (For a scholarly treatment of this topic, see Randolph Jonakait, The Two Hemispheres of Legal Education and the Rise and Fall of Local Law Schools, NYLS L Rev (forthcoming 2007)). David Zaring and I recently posted our "Young Associates in Trouble" essay, which provides some new empirical evidence on the BigLaw tournament. The essay reviews two recent novels that portray elite law firms (one in DC, the other in London) as an unending marathon of boring and substantively unfulfilling work. In turn, we compare these fictitious accounts with findings from a unique dataset based on the AmLaw Midlevel Survey, which includes questionnaire responses from several thousand 3rd, 4th, and 5th year associates. So what is the key takeaway? 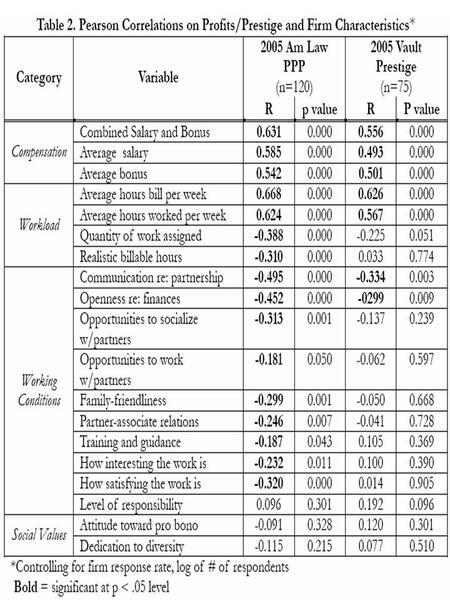 As shown in the table below, virtually every principle of enlightened management and social responsibility is either (a) associated with lower firm profits, or (b) irrelevant to the bottomline. The essay also includes some multivariate regression models that reveal that firms actually make more money when associates work on less interesting work or report a greater likelihood of leaving the firm within the next two years. In contrast, family friendliness, training and guidance, and feedback appear to have no effect on profits. More empirics and another graph after the jump. Obviously, young lawyers are compensated for their hardship, first in salary and bonuses, and second in the outplacement options that elite white shoe firms provide. One way to gauge the appeal of these jobs is to examine the proportion of graduates from elite law schools--a population with the most employment options--who begin their careers at the most prestigious (and grueling) law firms. The table below breaks down new attorney hiring patterns by law firms (Top 10 / non-Top 10) and law schools (Top 10 / non-Top 10). Obviously, as this table shows, elite law school graduates tend to experience harsher work conditions. A lot of ink is spilled over their miserable plight as if it reflected the state of the profession as a whole. But large law firms are not a single oppressive monolith. As the above graphic makes clear, graduates of elite law school ultimately have a choice to join a large firm that is (a) less prestigious and remunerative but (b) is more family-friendly, provides better prospects toward partnership, and requires significantly fewer hours. Indeed, the 25th percentile workweek in our sample is 54.2 hours, which is only slightly more than other lawyers beginning their careers. See ABA Young Lawyers Division Survey: Career Satisfaction (2000); After the JD: The First Results of a National Study of Legal Careers (2005). The main question we wrestle with in the essay is why elite lawyers are so reluctant to let go of a work environment that imposes significant costs on their personal lives. Sure, economists are comfortable concluding that health and relationships can be traded for current and future financial gains. But you let go of an external measure of success and accomplishment when you depart the white shoe world. If your whole life--college, law school, clerkship, employment at a fancy firm--has garnered external acclaim, many young lawyers may be reluctant to forgo prestige in favor of a more reasonable work-life balance. There is an undeniable existential dimension to these trade-offs--a topic perhaps most effectively explored through a novel. Young Associates in Trouble was a fun and challenging essay to write. In case you are wondering, we give a strong thumbs up to Kermit Roosevelt's In the Shadow of the Law. I am graduating this year from a respectable but non-elite law school, and will be starting a job with a respectable but non-elite large law firm. I have noticed a large difference in the degree of credibility afforded to my normative statements about the law based on 1) their self-evident considered basis, or 2) the listener's knowledge that I have been hired to do law stuff for $160K in a top market. Our legal system takes to absurd levels the use of rank-order proxies to determine merit. On every front, lawyers and law students evaluate the credentials of the speaker before even hearing the substance of the statement. Thus even in this comment I felt compelled to state my credentials up front. Having also studied engineering formally, and both film and literature informally, I feel confident in asserting that law is more concerned with prestige as a proxy for merit than any other academic pursuit. I have never felt so tracked as in law school, and non-compliance would only have marginalized my voice. Given that, of course law people have more trouble sacrificing prestige for the better life. The commodity value of prestige is higher in law than elsewhere, and as a prophesy, prestige reinforces itself. 5) Lower tuition some more. I enrolled wanting to represent the working class and study for law teaching. I cannot. But to keep perspective. When I graduated engineering school in the late 90s and started working, 60 hour weeks were considered light, and there was not this level of ink spilled over it. I'm starting to become more and more convinced that the reason lawyers have bad social lives is just bad socialization -- the natural consequence of conceptualizing life, love, work, and education as a tournament. I don't want to rain on the Marxist parade here, but Uncle Charlie (as I call him) is turning in his grave like a lathe over this interpretation. True, there is exploitation going on here, but the surplus value that pays for the young associates and the partners is extracted from the productive workers in the economy then distributed through rents to the service sector. It is the profits extracted in the productive process that are the basis for the exploitation of the workers and the alienation of the capitalist running dogs in the lawyer's clique. That means that the answer is both simpler and more complicated. How do the young lawyers end their exploitation? By ending the exploitation of the proletariat, of course. Marx always counted on that; that the alienation of at least some of the bourgeiosie to provide the intellectual leaven of the proletarian movement. (It worked that way too.) But, of course, to do that they have to be REALLY alienated. I mean Great Depression/Lawyer's Guild alienated. That is a more complicated solution then some kind of associate angst but it's the only thing that will work. After all, this is a SYSTEMIC problem. Or, at least, that's what Charlie would say. For another take on the whole question, one might refer to Lord Layard's recent essays on ecomonics and happiness. His research might show another way out. If profits weren't in the way, that is.